Contrary to the title, this is not a rubbish show, far from it. Although for Jan Eric Visser, one of the three artists in this exhibition, his private household waste is literally the primary ‘raw’ material for his sculptures. The three artists featured in the exhibition are: Yelena Popova, Jan Eric Visser and Joanna Rajkowska. They all work in different media, but their artworks are similarly concerned with ecology and human agency in the contemporary world. Yelena Popova’s pale paintings are made using natural ingredients. 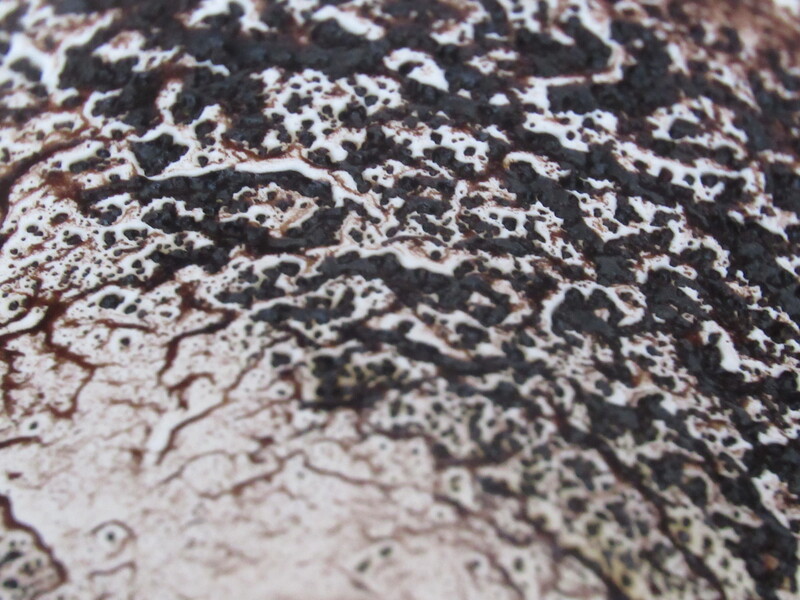 The artist collects ash and soil, grinds them and mixes with pigments in preparation for what she calls Post-Petrochemical Paintings. Popova’s abstractions consist of curving and angular shapes in pleasant earthy tones, which gives the works a certain meditative quality. Formally, these paintings relate to the Russian Constructivists and Kandinsky’s abstract works. Popova was born in Urals, in former USSR. Having grown up a heavily industrialised region, the artist is interested in problems that come with atomic power, industrialism and capitalism. Creating her own paints she also looks back at the medieval artistic traditions. She even called her process Medieval Modernism. With background in set design and construction, Popova is very much interested in the way her works are presented in the exhibition space. She often creates impressive installations, last year she had a solo show also at l’étrangère (Her Name is Prometheus, 2018). Yelena Popova Untitled (2018), wood ash, seaweed ash, soil on canvas. Jan Eric Visser, the Dutch artist began making his indoor sculptures in 1987. These works have a highly polished appearance, similar to that of more traditional sculpting materials, such as bronze, but the resemblance is only superficial. The core of these abstract sculptures consist of inorganic household waste mixed with votive candle residue and paper pulp. Visser also now works with interesting new materials for his indoor and outdoor sculptures: translucent concrete and aquadyne. The latter material is entirely based on recycled consumer plastic. In Visser’s own words ‘the form follows garbage’. Creatively using his own rubbish, it is the artist’s hope that in the future our society will be more sustainable. It is unusual to see a public art project in a commercial gallery, especially that Joanna Rajkowska’s Trafostation (2016 and ongoing) appears so different to the works of the other two artists. I talked to Joanna Rajkowska at the exhibition opening. The Polish artist’s best known art project is the enormous artificial Palm Tree on Aleje Jerozolimskie in Warsaw (Greetings from Jerusalem Avenue, installed in 2002). Rajkowska’s public artworks are always multifaceted. Included in this exhibition are photographs from her intriguing ‘rewilding’ project called Trafostation, for which the artist planted vegetation all over an unused 1930s concrete building of a transformer station in Wroclaw, Poland. Due to the nature of this work, it can be only truly experienced in situ, but the exhibition features a series of wonderful photographs illustrating the current state of the project. Trafostation is a work in progress and it is estimated by the artist to reach its maturity in 2050. Although as viewers we are aware of the physical aspect of the artwork, some of the photographs are abstracted to a point where we forget that we are looking at walls covered with algae. While Visser’s art seems to look towards a brighter future, where humans become more responsible users of our planet, Rajkowska is less optimistic. She does not seem to have much hope for the humanity. Her project seems is living metaphor of the impending destruction of our home on Earth, where plants ultimately take over any remains of the Anthropocene. Rajkowska’s project reminded me of the heroine of Olga Tokarczuk’s dark novel Prowadź swój pług przez kości umarłych, (Drive your Plow over the Bones of the Dead, 2009), who was so disillusioned with humanity, that she took her love of animals a step too far. Trafostation sends a grim message, but is not without hope. Rajkowska makes public art, with people in mind, it’s not art for art’s sake, she also does not shun from political issues. Each of the three featured artists takes a different approach to social and ecological concerns, such as consumerism and excessive waste resulting from our daily habits. In the exhibition at l’étrangère these works come together as fascinating examples of ecologically responsive art. Next Van Gogh and Britain – exhibition at Tate Britain.